Matching posts and holes make it easy for children to put continents in place in this first globe. 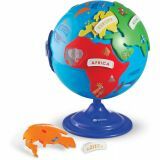 Spinning globe features animals and landmarks, 6 continent puzzle pieces, 6 continent labels, and sheet of blank label stickers. Antarctica is a permanent part of the globe. 8"D.